Ubuntu Reveal Results of GNOME Desktop Survey - OMG! Ubuntu! The Ubuntu desktop team has finally revealed the results of the recent GNOME desktop user survey. But if you were hoping to find some definitive decisions taken as a result of the results you’re in for disappointment. A massive 18,330 people took part in the survey. All 8 questions in the survey were optional, and all bar one asked participants to rate how ‘useful’ they consider various GNOME extensions to be on a scale of 1 (not useful) to 5 (very useful). The first question was about the (wonderful) Dash to Dock. 17,948 people participated in this question, with over 80% of all respondents rated Dash to Dock a 3, 4 or 5. Not that Ubuntu is being swayed too heavily by that landslide. That’s not an unfair, fence-straddling interpretation to make. But it is not (currently) possible to make the dock visible outside of the activities overlay in GNOME Shell without using an extension like Dash to Dock. Ubuntu will need to persuade upstream GNOME to add in an option specifically for this — and based on comments I read on Reddit, ‘accommodating’ isn’t the best word to describe GNOME’s approach to out-side contributions. Another high-rated extension in the survey was Top Icons Plus. This extensions integrates legacy tray applets and indicators with the rest of the GNOME status area. Given how many third-party apps make use of or rely on indicator applets by default (thanks to years of Unity’s dominance on the desktop) this, surely, has to feature in the default install. Nearly 90% of respondents rated Top Icons Plus as being useful. The results for Impatience (which speeds up GNOME Shell animations), Alternate Tab (which makes GNOME’s alt+tab switcher work like Unity’s) and Better Volume Indicator were all overwhelming in favour of them being ‘useful’. The most divisive results were for No Top Left Hot Corner and Applications Menu. The applications menu extension dispenses with the full-screen activities & applications screen for a simple, two-column app menu accessible on the desktop. While 30.6% rated this a full ‘5’ for usefulness, 22.6% rated it a ‘1’. And for the extensions that disables the top left trigger area things were even tighter, with 27.5% rating it ‘5’ but 26% rating it a ‘1’. 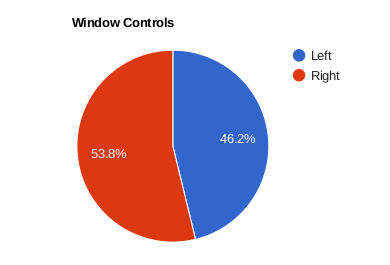 The final question in the survey asked you which side window controls should sit. This was, arguably, the one question guaranteed to divide opinion straight down the middle. 46.2% of survey participants say they want window controls to stay in the top left, as in Unity, but 52.8% favour GNOME’s default of the top right. Ubuntu Desktop team member Ken VanDine suggests that it “probably makes sense to follow GNOME more closely here” though fails to commit fully. So while it may seem like a switch back to right-aligned window controls is now inevitable, don’t fret. My gut says Ubuntu won’t switch. While the results of the survey our out decisions are yet to be made. As such, don’t expect to boot in to tomorrow’s daily build and find all of these extensions installed. “Now that we’ve collected all this useful data, we need to discuss the best means to accommodate our users while still having a desktop we can properly maintain and support,” says Ken VanDine of the Ubuntu Desktop team. Short of a few sprinkles on top, Ubuntu 17.10 users may yet find themselves dining on a vanilla GNOME desktop this October.